Whether you're stuck in the car for a long road trip, running late to class, or even just finished a killer workout - these four high protein snacks will keeping you feeling, and looking, your best. Ok I get it - a gas station is probably the last place you would ever think to stop when you're in need of a healthy snack and you're on the go. 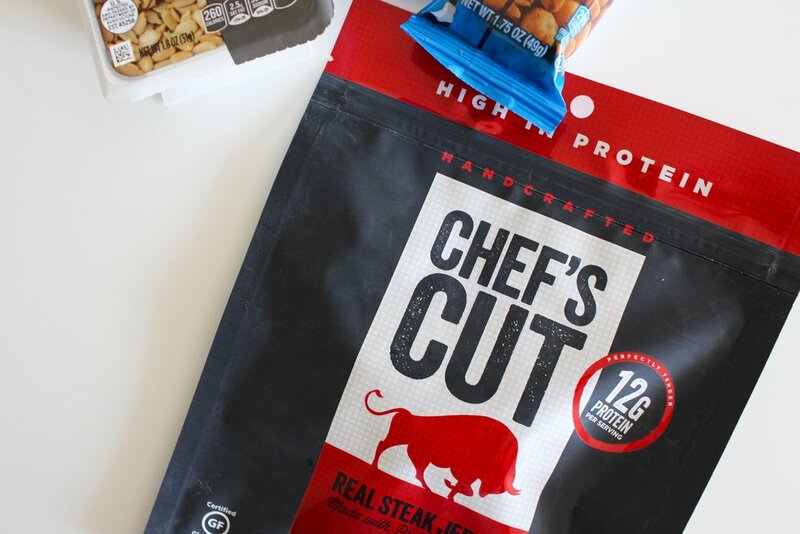 But believe it or not, many gas stations have plenty of options that are high in protein and calorie friendly. I've been using this trick for years and no matter which gas station - I have always been able to find something to fit my diet. When it comes to finding the healthiest snacks in the most unexpected places, I'm ya girl! After a crazy afternoon and a gas tank on E, I decided why not put this weird thought to the test and show you the great things I can find in your everyday gas station. (not including WaWa, Sheetz, Get Go-ish types). I wanted to pick a gas station that could resemble any gas station across the country so that nothing was too far fetched. *Obviously ordering a grilled chicken salad isn't common gas-station cuisine* We live relatively close to a Shell station with a small franchised corner store attached, so I figured anything they might carry - you should be able to find something similar. First up was the classic nut isle! It's like they knew I was coming. I saw a ton of different options for nuts, sunflower seeds, and even some snack packs. I instantly thought almonds, peanuts, and pistachios. Nuts are packed with healthy fats and plenty of protein per serving. Though you might think they're high in calories and fat, just remember that is healthy fat and still under 300 calories per serving. Be careful not to be fooled, although they had a lot of healthy options, they also had a lot of chocolate covered and extra salt options also. My recommendation is to find lightly salted, seasoned or plain if you can. Seasoning often times adds flavor without calories. So make sure you are reading your labels and quieting your sweet tooth! I also found that purchasing a few smaller bags is a safer bet than a large bag. With the snack size bags, you know your portion. If you're anything like me, I can snack for hours just because of the repetitive motion but with nuts, calories and fat can add up quickly. Speaking of portions, I love these P3 packs by Planters! If you want variety within your serving size, these are perfect. They also had a few different options as far as actual products in the package. Some are not a fan, and I never was. Tightly wrapped in plastic and could last a life time on a shelf, beef jerky was always so gross looking. And not to mention packed with sodium and preservatives. But I will say, the life of jerky has come along way and you might be surprised with a few new products. 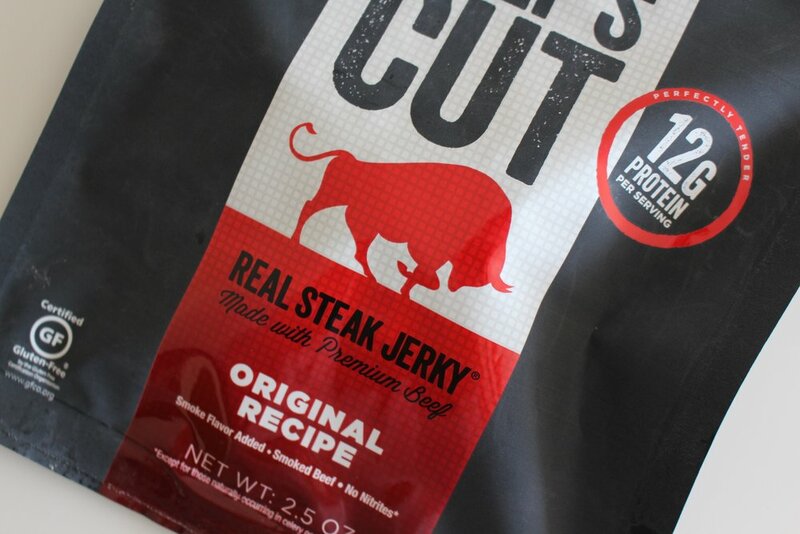 Moving aside the classic beef sticks, I stumbled upon this Chef's Cut beef jerky - a 'real' beef jerky. After doing a little reading in the gas station, I learned that they don't use any nitrates, certified gluten free, and only 100 calories per serving. They are sold in many stores such as GNC, Target, and chain groceries - oh and now gas stations. I told you there were some hidden gems here! You probably knew this one was going to be on here! I couldn't not mention protein bars. I know this one is obvious, but maybe to some protein bars are still considered bro food. This has to be one of my favorite ways to get in some calories and protein. Whenever I'm running errands, busy at work, and just hungry after a day at the gym - I love protein bars. However, most gas stations have always had the super-bulk, sugary versions that many of us girls stay far, far away from. Well great news! This small gas station had some pretty great brands including Power Bar, Quest Nutrition, and these all natural Detour Bars. When you're looking for a protein bar, try to remember the tips I mentioned above. Make sure you aren't about to devour a 500 calorie protein bar, my as well have yourself a candy bar! Also look at ingredients. Are you seeing a lot of synthetic additives and chemicals? If so, put it back. Once I came across these Detour Simple bars, I knew I had to mention them. They have roughly 210 calories per bar, 20 grams of protein, and 6 grams of fiber. And unlike most bars, these use Stevia as a sweeter rather than sugar alcohols - another big no no. If you aren't having any luck with these four options, don't forget about the good old refrigerator! More often than not, many gas stations will have 8 oz. of skim or 1% milks. It's often times over looked and ignored because nutrient-shaming, but there is a lot of protein and healthy fats in milk. Not to mention the amount of vitamins and minerals you're getting from just one cup. Who knows, maybe your grocery might even carry a small almond, soy or Muscle Milk version! I've also noticed many gas stations have fresh fruit as options also. So, don't forget to check the fridge! Skipping a meal or ignoring a hungry belly might be why you aren't seeing any process in the gym. It might also be a reason you can't seem to focus throughout your day. Of course these aren't ideal for your everyday diet, but eating something is better than not eating anything. What are some of your favorite gas station/mini mart finds? ?